"All the material has been well recorded — the drums are generally powerful, the basses thunder and the majority of the guitars growl. 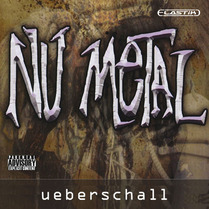 4/5 STARS"
If you need to conjure up something on the darker side of modern rock (think Korn or Papa Roach), then Ueberschall's Nu Metal might be just what you are looking for. The title is distributed by Time + Space and is supplied as a two-CD set, with CD1 in audio format and CD2 containing the same material as Acidised WAV files. I used the latter for the purposes of review. The material is organised into eight construction kits plus additional folders containing drum loops, drum breaks, bass guitars, distorted guitars, guitar FX, break kits and acoustic guitars. With some 650MB spread over nearly 600 loops, there is plenty to get your teeth into. The construction kits contain A and B 'parts' that might be used for song construction, and a 'full mix' WAV is provided to demonstrate what can be done. Of course, all the component drum, guitar and bass parts are provided so you can mix and match as desired. The separate 'break kits' folder contains combinations of guitars, bass and drums intended to work as links between musical sections, and these can be added to material from the main construction kits to provide further variety. Most of the other folder titles listed above give a clear idea of their contents, but if you like your riffs low and loud, the highlight is probably the distorted guitars section. Using the Acidised WAV files with Acid Pro 4, it was an absolute doddle to construct some very authentic-sounding backing tracks. All the material has been well recorded — the drums are generally powerful, the basses thunder and the majority of the guitars growl. And while the Nu Metal title suggests Limp Bizkit, there is plenty here that would work in a Metallica-type track. Mixing material between the various construction kits proved perfectly possible, as did working in additional material from the supplementary folders. The variations and break kit sections all helped embellish a piece to make its loop origins less obvious. In terms of content, my only criticism would be the lack of a few more riffs based further up the neck — I know seven-string instruments are the weapon of choice for many nu-metal guitarists, but it would have made it easier to combine two guitar riffs as they would not be fighting for the same mid/low-frequency space. I could also have managed without the vocal samples. While it was perfectly possible to create complete backing tracks with just these loops, combining them with some electronica loops (for example, some drones or processed turntable scratching) added another dimension — instant Linkin Park. Just add some lead guitar/counterpoint riffs and suitable vocals and the final result is very convincing. Most guitarists who play in this style would probably like to roll their own when it comes to nu-metal riff-making, but for non-guitarists looking for an authentic dollop of the heavy stuff, then this sample set has a lot to offer. If you work in library or production music, however, note that the licence does not allow the samples to be used for this purpose. While this is not uncommon amongst loop libraries, it is a restriction to be aware of.